Arsenal ended a run of three Premier League games without a win as a four-goal burst in the first half helped to see off Crystal Palace. Nacho Monreal opened the scoring with a header and then assisted both of the next two goals for Alex Iwobi and Laurent Koscielny inside 13 minutes. Alexandre Lacazette then rounded off a brilliant move to make it 4-0 after 22 minutes. Luka Milivojevic scored late on, but Palace slip to 13th in the table. Arsenal remain sixth, two points behind Tottenham. Monreal's part in Arsenal's victory lasted just 34 minutes, with the Spanish defender being substituted due to an injury. His inclusion in the starting line-up was one of four changes to the side that had lost 2-1 at Bournemouth last week, with Mesut Ozil, also recalled after injury, outstanding in partnership with Jack Wilshere. Palace were much improved in the second half, but ultimately paid the price for their poor defending in the early part of the match to end a run of five games unbeaten away from Selhurst Park. Yohan Cabaye was carried off on a stretcher just before full time, and may add to a lengthy Palace injury list that includes Ruben Loftus-Cheek, Andros Townsend, Mamadou Sakho and Scott Dann. Most of the news about Arsenal in the days leading up to this win was about players who were not to feature at Emirates Stadium. Alexis Sanchez was omitted from the squad once again, with his move to Manchester United seemingly inching towards completion. Possible moves for Borussia Dortmund's Pierre-Emerick Aubameyang and United's Henrikh Mkhitaryan had also dominated the Arsenal news agenda of late, but this was a performance that was perfectly timed for manager Arsene Wenger. His side had won only twice in their last nine league outings, but having Ozil, Monreal, Koscielny and Mohamed Elneny back gave Arsenal a much steelier look and feel compared to the one that had a lead overturned at Bournemouth last time out. Ozil touched the ball six times in the wonderful move that ended with Lacazette's goal, the German international providing the assist with a deft touch into the striker's path. Arsenal may not come up against a defence as leaky as Palace's in the remainder of the season, but if they are to make a couple of attacking additions then this display bodes well for the post-Sanchez era. Palace's revival under Hodgson had seen the Eagles recover from a disastrous start to the season - no goals or points until a 2-1 win over Chelsea in the eighth game - to arrive at Arsenal in 12th place. But slack defending put them on the back foot from the moment Monreal was allowed to head the ball home at the far post unmarked from a corner. 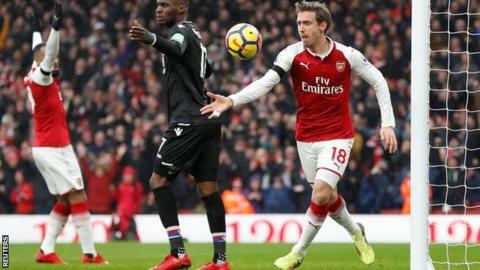 Timothy Fosu-Mensah gave the ball away inside his own area, allowing Monreal to feed Iwobi and Palace were three down when Monreal was alone again at another corner to set up Koscielny inside the six yard box. Christian Benteke's attempt for what could have been the Belgian's second goal of the season, when he shot straight at Petr Cech with Wilfried Zaha in space a few yards away, summed up a poor day for the south London club. Milivojevic's well-taken goal was scant consolation, although it meant that Cech's quest for his 200th Premier League clean sheet goes on. Arsenal manager Arsene Wenger: "We played our real game in the first half, real pace and real combination. In the second half the challenge was to keep the same drive and we didn't manage to do that. "The speed of our game at the start was good. We are the only team to beat Palace in their last 12 games. "Not scoring had played on Lacazette's mind, it was starting to get heavy for him so that is a relief. We know the challenge in front of us is very difficult, exciting as well. "For 45 minutes our fans have seen some great football." Palace manager Roy Hodgson: "Three goals in 13 minutes put us on the back foot, it was a poor first half. Second half we at least played like the team we try to be. We took a heavy beating but at least it didn't get any worse. It could have become an avalanche of goals. "It was easy street for Arsenal but we made it hard for them in the second half. We lost our marking twice on Nacho Monreal and he punished us, I don't think it's a malaise in the club or the way we play but Arsenal found a weakness today. "They were every bit as good as they can be today. They scored a really good 'Arsenal goal' as well." Alexandre Lacazette's strike was the 500th by French players for Arsenal in the Premier League (excluding own goals) - 358 more than any other side in the competition. Arsenal went 4-0 up in the opening 22 minutes in this game - the earliest a side has led by that many in a Premier League game since Liverpool against the Gunners themselves in February 2014 (20 minutes). Nacho Monreal was involved in three of Arsenal's goals before being substituted (1 goal, 2 assists) - as many as in his previous 43 Premier League games combined (2 goals, 1 assist). Roy Hodgson is now winless in all 11 of his Premier League away London derbies as manager (D3 L8). Arsenal are now unbeaten in their last 19 Premier League home games kicking off at 3pm on a Saturday (W17 D2), since losing to Aston Villa on the opening day of the 2013-14 campaign. Luka Milivojevic scored his seventh Premier League goal - with the Gunners the only team he's scored against more than once. Crystal Palace have now lost just two of their last 13 Premier League games (W5 D6), with both defeats coming against Arsenal. The Gunners host Chelsea in the second leg of their EFL Cup semi-final on Tuesday, 23 January at 20:00 and, after sitting out the FA Cup action next weekend, they then travel to Swansea in the Premier League on Tuesday, 30 January with kick-off at 19:45. Palace are also out the cup, and next play when they take on West Ham away on 30 January at 19:45. Match ends, Arsenal 4, Crystal Palace 1. Second Half ends, Arsenal 4, Crystal Palace 1. Attempt blocked. Alexandre Lacazette (Arsenal) right footed shot from the left side of the six yard box is blocked. Sead Kolasinac (Arsenal) wins a free kick in the attacking half. Substitution, Crystal Palace. Jairo Riedewald replaces Yohan Cabaye because of an injury. Substitution, Arsenal. Sead Kolasinac replaces Alex Iwobi. Attempt saved. Alexandre Lacazette (Arsenal) right footed shot from the centre of the box is saved in the bottom right corner. Attempt saved. Alexandre Lacazette (Arsenal) left footed shot from the centre of the box is saved in the centre of the goal. Assisted by Jack Wilshere with a through ball. Goal! Arsenal 4, Crystal Palace 1. Luka Milivojevic (Crystal Palace) right footed shot from the centre of the box to the bottom right corner. Assisted by Christian Benteke with a headed pass following a corner. Corner, Crystal Palace. Conceded by Shkodran Mustafi. Corner, Arsenal. Conceded by Patrick van Aanholt. Attempt blocked. Héctor Bellerín (Arsenal) right footed shot from the right side of the box is blocked. Assisted by Alexandre Lacazette. Substitution, Arsenal. Reiss Nelson replaces Mesut Özil. Attempt saved. Mohamed Elneny (Arsenal) right footed shot from the right side of the box is saved in the centre of the goal. Assisted by Alex Iwobi. Offside, Arsenal. Jack Wilshere tries a through ball, but Mesut Özil is caught offside. Delay in match Jack Wilshere (Arsenal) because of an injury. Attempt saved. Christian Benteke (Crystal Palace) right footed shot from the right side of the box is saved in the bottom left corner. Assisted by Bakary Sako with a cross. Corner, Arsenal. Conceded by Wayne Hennessey. Attempt saved. Alex Iwobi (Arsenal) left footed shot from the left side of the box is saved in the bottom left corner. Assisted by Mesut Özil. Attempt saved. Martin Kelly (Crystal Palace) right footed shot from the centre of the box is saved in the centre of the goal. Assisted by Christian Benteke with a headed pass. Corner, Crystal Palace. Conceded by Héctor Bellerín.